I’ve been the beneficiary of multiple rounds of sweet onions in my CSA during the past few weeks. While in the winter I use onions left and right for soups and warm comfort foods, I never realized that they weren’t a big part of my summer repertoire. Sure, I use them here or there but I tend to sway toward herbally green onions instead. With a desire to throw as much on the grill as possible in the summer I decided to use my onion bounty to create a gourmet burger. 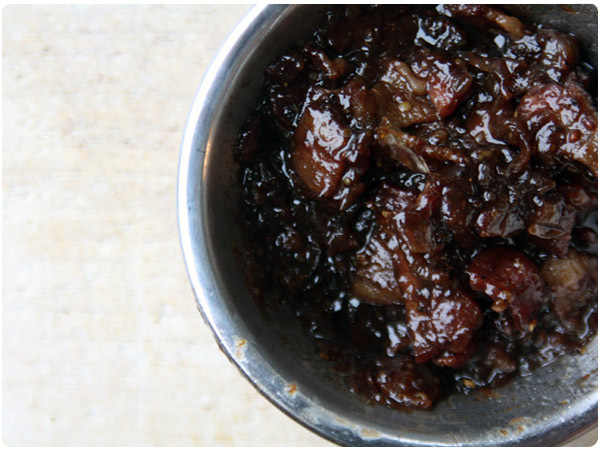 I wanted to caramelize them somehow – I don’t care for them raw – and was lured in by a savory Bacon-Onion Jam recipe on Pinterest. 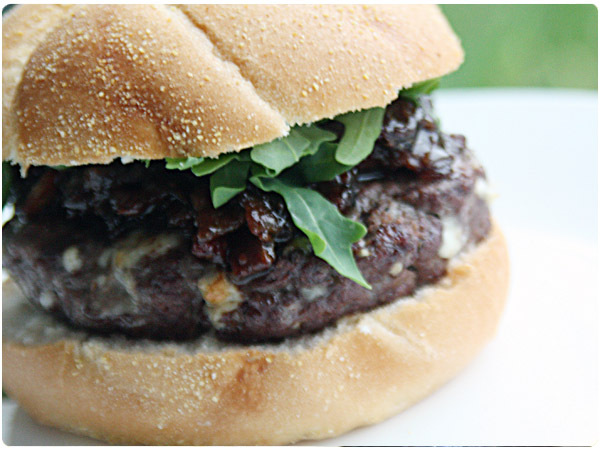 The smoky-sweet jam is chock full of some of my favorite big flavors so it needs a burger that can stand up to it. Enter blue cheese – which does double duty as a fatty/creamy binder if you happen to be using an ultra lean game meat like the elk that I used. Beef will work just fine of course but if you happen to have access to game meat it cuts the richness (and calories) down a little. Serve with a simple salad to let the burger itself take center stage. In a large bowl, combine ground meat with garlic, liquid smoke, Worcestershire, black pepper and salt. Mix well using your hands. Add in crumbled cheese and mix gently to incorporate. Portion out meat mixture into 3-4 balls, depending on the size of hamburger patty that you prefer. Gently pat the balls into round patties and use your thumb to indent the middle for more even cooking. Place on a the upper grill rack of a medium-hot gas grill and cook for six minutes. Flip burgers and cook for another 3-4 min for a “medium” preparation. Burger thickness, your exact grill and your preference in preparation (ie, medium rare versus well done) will cause variance in cooking times to adjust according to your preferences. Heat a large saute pan over medium-high heat. Add the bacon and cook, stirring occasionally until browned but not crispy, about 6-7 minutes. Meanwhile, slice the onions – I like mine sliced paper thin for better caramelization. Remove the bacon from the pan and let it drain on a paper towel-lined plate. Stir in the onions, and season with salt and pepper. Cover the pan to cook the onions for 2 minutes. Uncover the pan and scrape any browned bits off of the bottom of the pan with a spatula or wooden spoon. Recover the pan and cook the onions for another 10 minutes, stirring occasionally, until the onions are soft and beginning to caramelize. After the onions have cooked, stir in the balsamic vinegar, mustard, and water then return the bacon to the pan and bring the mixture to a simmer. Simmer uncovered until the sauce thickens and is almost completely absorbed, about 5-7 minutes. If using immediately, set it aside in a bowl until ready to use. 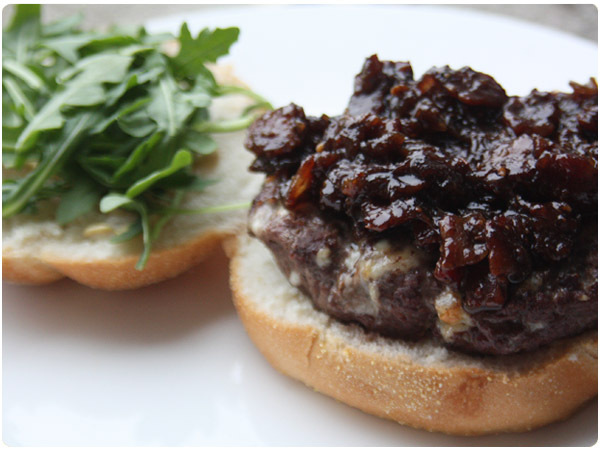 To serve: Place burger on the bun and top with jam and arugula. I will be making this! Thanks! HB to Lil man too.